This study was carried out in eleven fishing regions of Ataturk Dam Lake covering borders of Adiyaman province during the fishing period between July 01, 2010 and March 31, 2011. Within the context of the study, technical features of fishing gears used in fishing, and their numerical distributions according to the length and motor power of fishing boats, catched species and fishing problems were studied. As a result of the study, it was determined that only the gill nets were used in the region and that % 96.0 of these nets geared with hanging ratio of 40.0-42.0 is monoflament polyamid and % 4.0 is multiflament polyamid structurally. 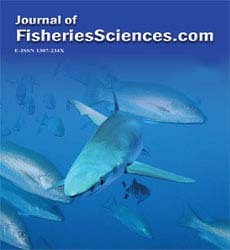 According to the species having been targed and usage of nets on the surface or in the depth, it was determined that exact mesh size was 36-250 mm of nets twine number of nets the mesh number of which varies between 50-100, according to the vertical mesh number was between 0.18-0.29 mm in monoflament nets and 210d/2 and 210d/12 in multiflament nets. These nets, each having a gang length that varies between 80.0-85.0 m and whose gang number having been determined as 2133 in the study region are used by 162 fishing boats. It was determined that carp (Cyprinus spp), trout barb (Capoetta trutta), shabbout (Barbus grypus), catfish (Silirus triostegus), bleak (Chalcalburnus mossulensis), golden barb (Carasobarbus luteus), abu mullet (Liza abu), kalashpa (Acanthobrama marmid), pointed barbel (Barbus rajanorum) and nose-carp (Chondrostoma regium) head the most frequently catched fish species.